To be honest, modern bedroom design can excite any visitor. Not only it is lavish and contemporary, but the minimalism of modern rooms also encourages a sense of serenity, relaxation, and a good night’s sleep. Simultaneously, these bedrooms can be attractive and full of pleasure for many clients. 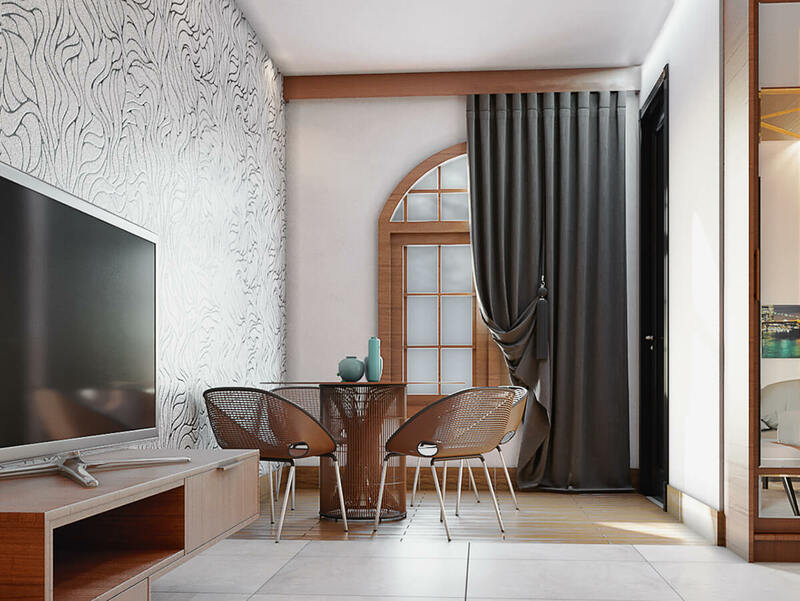 Bright stone flooring of the rooms emphasizes the simplicity and minimalistic atmosphere of the room and helps to attach and combine different types of furniture. Small wooden pieces like a bed and decorative ceiling in the room help to add some spirit and warm accent to the room and break the monochrome color of the room. Three piece photograph on the wall combines with these wooden parts to enhance this effect. 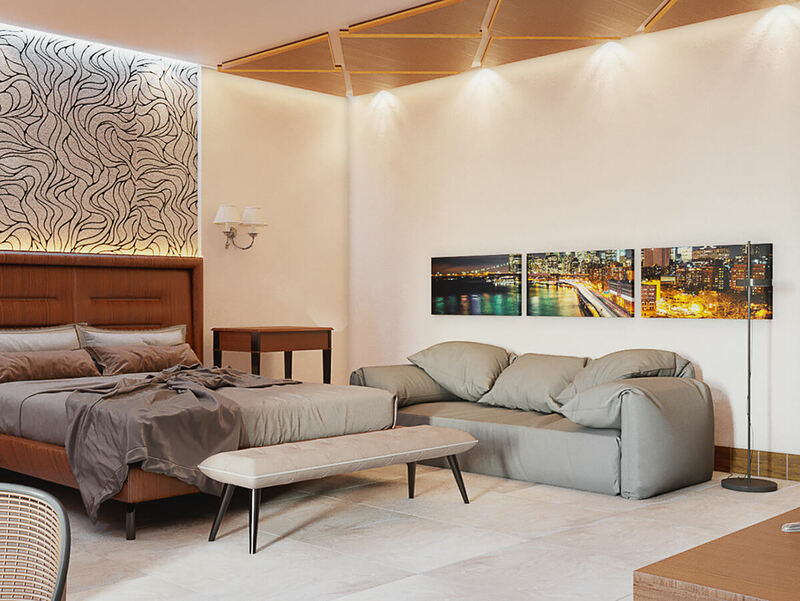 Hidden lighting on the wall and behind the bed creates the depth and focal point in the room and can be used during the night when you want soft and smooth light. 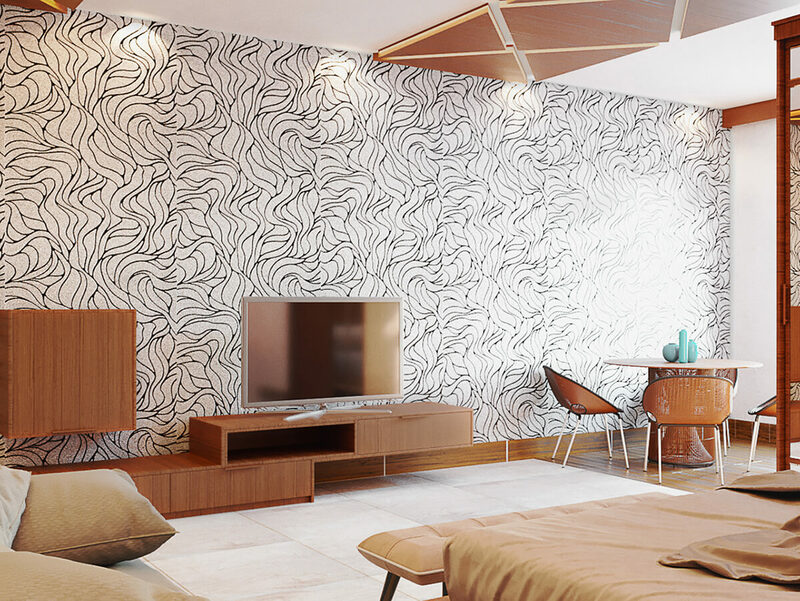 Wallpapers stick to walls simply and efficiently, covering imperfections on them, and therefore these features make it perfect for renovation projects like this bedroom interior design. It adds warmness, depth, and stylishness to this bedroom that a simple paint cannot achieve easily. Attractive design, exciting texture, and lovely sinuous shaped waves create an astonishing focal point and décor for this bedroom. Wooden furniture also repeated in this part of the room for a TV table. The wooden decorative ceiling plays a vital role in this room to connect this wooden furniture around the room together and create a bigger whole. The spotlights on the ceiling created the dramatic lighting effects on the wall and combined with the natural light provides the main light source for the room. More than just a room to sleep, your bedroom must be a place where you can rest and relax at the end of your hard day. One great way to make that happen is including a comfortable seating area in your bedroom. In this project, the seating area is placed near the window and changing the flooring from stone to parquet create an emphasis on this space. 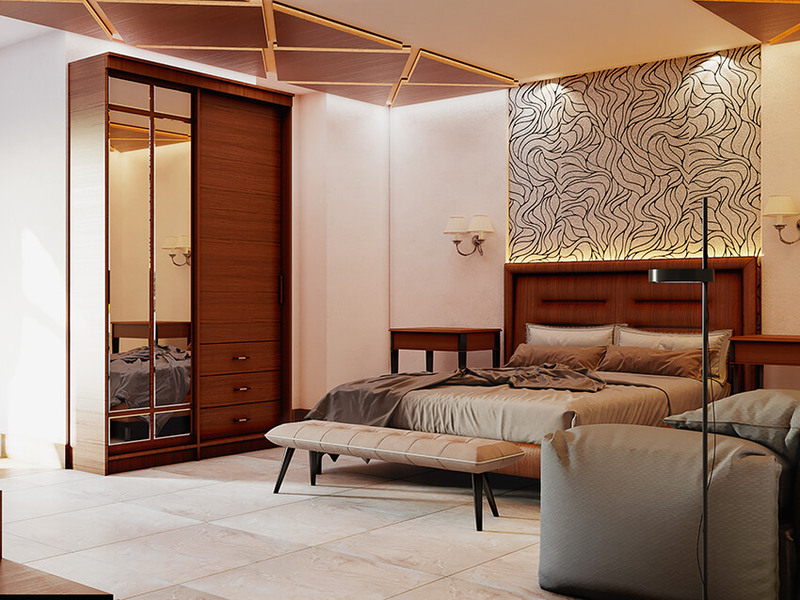 Our architectural visualization team chose simple and stylish furniture for this bedroom with a bright brown color that matches flooring and window frame. A dark color curtain can create privacy when our clients need it, and in other situations, it’s a really beautiful decorative piece.